How to set up the 123FormBuilder – Wix Contacts integration? Use the 123FormBuilder – Wix Contacts integration to collect data in your Contacts on Wix, through form submissions. Interact with your website visitors, gather contacts and establish new relationships in a quick and easy manner. The application is automatically enabled once your web form has been added on your Wix webpage. Important: The integration works only when the online form is submitted on a Wix webpage. 1. In the 123 Form Builder from Wix, click on the Customize button. You’ll be redirected to the panel, where you can associate Wix Contacts fields with form fields. Hit Save to exit the lightbox. 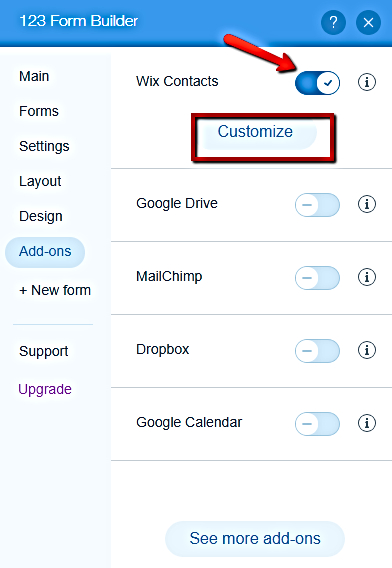 In Customize, Wix Contacts fields are located on the left and the form fields can be associated in the dropdowns on the right. You may attach avatars to your contacts. Just add a File Upload field on your form and match it with the corresponding Wix Contacts field in the customization lightbox. In the News Feed section of your contacts you can see the name of the form through which the contact was submitted. 2. In 123FormBuilder, go to the Settings → Applications section of your form and you’ll find the Wix Contacts application. Is there a way to make a form trigger an Automated Email/Shout Out from Wix when it is filled out? You can use Wix Contacts integration to collect data in your Contacts on Wix after the form has been submitted. The application is enabled automatically after the form is published on your Wix webpage.You can customize the application by associating Wix Contacts fields with form fields. If you need more information please contact us on support@123formbuilder.com. Is it possible to add the contacts automatically to a group within Wix contact? The submissions you receive are automatically sent to the All Contacts and Contacted Me sections in your Wix Contacts app. From there, you can manually assign them to other groups. Please do not hesitate to reach out to our Support team at support@123formbuilder.com in case you need further assistance. For some reason, the fields are not porting over to the WIX contacts fields as one would intuitively expect. For example, I cannot link the COMPANY NAME in 123fb app to port over to WIX COMPANY NAME. The ‘customize form fields’ option in the advanced menu doesn’t link to WIX fields almost entirely. Is there some linking on your backend to make these more functional? As a first step, you can try to remove the application and then integrate it again with your form. Make sure you match those fields, so they are sent to your Wix Contacts list. Also, note that the data is sent when your users are completing the form from your website and not from its direct link, so the form needs to be published on a website before being accessed. Please reach out to our Support team at support@123formbuilder.com, or, through our contact form, in case you require further assistance. Hi, Can I easy get all information frpm form to contacts like name, adress, phone, e-mail? I need i to invoicing. I apologize for replying this late. Yes, you can retrieve that information with the Wix Contacts integration. Simply check the box Use custom field associations to send data to Wix Contacts, within the customization lightbox, and map the fields. Have you encountered any issues? I made the customization and associate Wix Contacts fields with my form fields. So now, what should I do into WIX (into my website) to see all submissions made via my 123Form? If I set the email in the 123 form builder does that change where my regular wix email goes? Your emails from Wix are independent from what you receive from the 123 Form Builder. Whenever someone interacts with your web form, you’ll receive emails to the address you’ve set up in the 123 Form Builder app. If you need more assistance, don’t hesitate to contact us at support@123formbuilder.com and our Support Team will get back to you as soon as possible. Can I get notifications when a form is filled out on my website or do I have to keep checking my wix contacts page? Regarding your question. Yes, you are notified via email each time a new submission is made. To learn more, follow our article: http://www.123formbuilder.com/docs/step-by-step-notifications/. What happens when you have fields on your form which do not match a Wix option? How does the form field transfer? Only the form fields that are associated to Wix fields will be sent to the contacts list from Wix. The other fields you can find in the Submissions section of your form. Is it possible to group submissions into a list within Wix Contacts? I am hoping to group submissions via this form to the group “Potential Customers” within Wix Contacts. With the 123FormBuilder – Wix Contacts integration, all contacts that have been created through form submissions appear in Wix, under All Contacts. We do not send contacts to certain contact groups. You can request any improvements or new features on our Feature Requests page. Hello. I’ve linked contact form with Wix contacts, but feel that not all contacts come over … How can I export the contacts to Wix format, so I can complete the list? Have you compared your entries from the Submissions section of your 123FormBuilder account with the ones from Contacts in Wix? Compare the two lists and see if an entry or more are missing in Wix. Don’t hesitate to contact our Support Team for any kind of assistance regarding your 123FormBuilder account, via email at support@123formbuilder.com or through our contact form.